For the second year in a row, Lake Superior froze around Isle Royale National Park in Houghton, Michigan. This allowed wolves and other land animals to leave the island. But it could also have caused deaths within the dwindling wolf population. After this winter, the Isle Royale wolf numbers were down to just three, as shown by the results of the 57th annual winter survey by Michigan Technological University, the longest-running predator-prey study in the world. Six of the nine remaining wolves disappeared, but whether it was because they walked across the iced-over lake or simply died is still in question. Researchers know that one radio-collared wolf died, but the other missing five were not tagged and thus there is no way of knowing exactly what happened. The identity of the three remaining wolves can’t be verified until genetic testing is completed this year, but are suspected to be a male and female of 4 to 5 years old – close to the end of the average wolf life span in the wild – and a pup around 9 months old that is showing signs of genetic defects. Scientists believe that these last three wolves may not make it to next winter and that the deformed wolf may already be dead. The deformities of the pup are a result of inbreeding, and a clear indication that the wolves are in desperate need of a “genetic rescue.” The wolves numbers have dropped since 2009 by 88%, from 24 to these three, which was probably due to such inbreeding. Even if this pup were healthy, however, it would not necessarily be promising. With just three wolves, it is unlikely there would be a natural recovery within the population. A “genetic rescue” would entail transporting new wolves onto the island for breeding, which could naturally correct genetic problems like spine deformities and others issues. But Michigan Technological University ecologists and co-leaders of the study John Vucetich and Rolf Peterson – who has worked on the study for more than 40 years – say it’s too late. Over the past six years, they have made a case for human intervention to no avail and now there’s little to no hope. Down to just three, the wolf numbers are too low and the older pair would not be very interested in mating with newly introduced wolves. The only real chance for these wolves’ survival is if new members of the species come over to Isle Royale. Isle Royale initially got its wolves in 1949, when Lake Superior froze over and a pair came into the park. Through those two original wolves, the population increased, averaging 23 over the years with as many as 50 in the 1980s and 30 in 1995. When the lake froze in 2013-2014, there was hope that some wolves might wander over from Canada, Michigan or Minnesota but instead one wolf left and was later killed. This winter, a new pair did enter the island but left again shortly and, unfortunately, did not intermingle with the resident wolves. In the meantime, the moose population is growing at 22% a year, causing another worry for the area. The last four years has seen such light wolf predation that moose now have 1,250 of its species. Within five or so years, they will grow faster than their habitat can sustain and their numbers will then drop drastically. So far, there are no intentions for humans to introduce new wolves to the national park. Isle Royale is making a new management plan, which could recommend such introduction, but it will be years before the plan is adopted. These are the dramatic first lines spoken by Julia Roberts in Conservation International’s chilling series of short videos about environmental protection. The series, entitled “Nature Is Speaking,” features eight celebrities who speak as the voices of different parts of our planet that are threatened by humans. Nature doesn’t need people. People need nature. Human beings are part of nature. Nature is not dependent on human beings to exist. Human beings, on the other hand, are totally dependent on nature to exist. The growing number of people on the planet and how we live here is going to determine the future of nature. And the future of us. Nature will go on, no matter what. It will evolve. The question is, will it be with us or without us? …there are aspects of how our planet evolves that are totally out of our control. But there are things that we can manage, control and do responsibly that will allow us and the planet to evolve together…Our movement is dedicated to managing those things we can control…Country by country. Business by business. Human by human. We are not about us vs. them…This is simply about all of us coming together to do what needs to be done. In April, a female Irrawaddy river dolphin was found dead close to the border of Laos, reducing the area’s population to five. 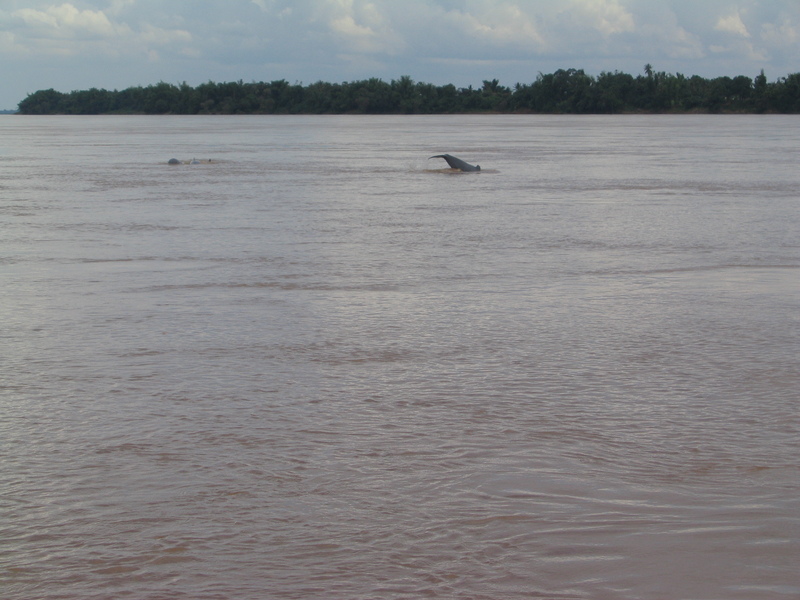 Locals discovered the dolphin on Cheutal Touch Island, Cambodia and immediately alerted river authorities. She weighed approximately 490 pounds (223 kilograms) and measured nearly 8 feet (2.4 meters) long. Although, the cause of death is unknown, marks on the female’s body indicated old age. The Irrawaddy dolphins, which inhabit the Wang Paa Khaa river pool, have been fighting for survival over the past few decades, due to gillnet entanglement and illegal fishing methods like explosives and poison. Gillnet entanglement, in particular, has been identified as the main cause of dolphin mortality. Cambodia has banned gillnet fishing on its side of the border, but Laos has only prohibited its use in the deepest parts of the pool. In addition, Laos is planning to build the 260 megawatt Don Sahong Dam, which poses perhaps one of the largest threats to the dolphin population. The dam’s construction will entail the use of explosives to unearth tons of rock that will potentially kill or seriously harm nearby dolphins. In the past, as many as 40 to 50 dolphins used this river pool, but numbers fell to 25 in the 1990s. Despite this drop, the dolphins are a major source of tourism and attract around 20,000 visitors per year. There are approximately 85 dolphins left in the Mekong River, most of which reside in Cambodia.